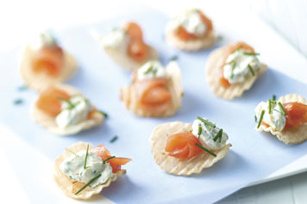 Ridged potato chips are the perfect crispy base for these easy-to-assemble salmon-and-cream cheese appetizers. Top with cream cheese mixture. For best flavor, prepare cream cheese mixture ahead of time. Refrigerate up to 24 hours before using as directed. Garnish with additional chopped fresh chives. Prepare using PHILADELPHIA Neufchatel Cheese and baked potato crisps.